Stand Height(Tripod matched with selfie stick): Min 38.3cm, Max 103cm(Light ring size not included). 1 x Tripod. No pollution, no infrared and thermal radiation. Provide bright and soft light, fit for photostudio lighting. LED Quantity: 180Pcs. Color Temperature: 5500K. As we all know, traditional incandescent bulbs have been gradually replaced by newest and high-tech LED ring light in many places, such as photo studio and so on. Color Temperature: 5500K. Dimmable 6" LED SMD Ring Light with a wide dimming range from 1%-100%. Dimmable: YES. Total illumination: 3600LM. 1x table mini tripod. Special LED SMD design, lightweight and portable. Color Temperature: 5500K. Dimmable: YES. Light weight, make it perfect for traveling with portable carrying bag. Light Source: Led Ring Light. 1x 18" LED Ring Light. We will update the new products one after another. Attach white and yellow filters with magnet and put spared one on the. Type:Video Lamp. Alaways used in wedding recording. 1 x 112 LED Video Lamp. USB port only for charging. Can also mount on lamp stand with 1/4" screw. Light weight, make it perfect for traveling with portable carrying bag. Dimmable 18" LED SMD Ring Light with a wide dimming range from 1%-100%. 1 x LED Ring Light Dimmable Ring Light. Dimmable: YES. Color Temperature: 5500K. No pol lution, no infrared and thermal radiation. Provide bright and soft light, fit for photostudio lighting. 12" LED Ring Lights. Compact size, reasonable price and high quality. 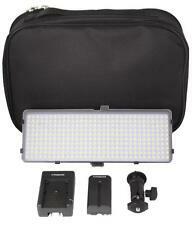 Dimmable 176 LED Video Light Dimmable Range: 10 percent-100 percent. LED Bulb Quantity: 176 Pieces. Compact design makes it convenient to use in different photography occasions. 1 x 176 LED Video Light. 72 LED lamp beads. 1x Bracket. - Color temperature: 5500K. 1x Ring light. 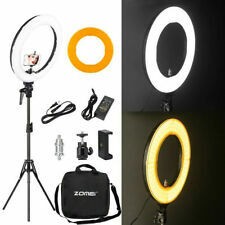 - 3 kinds of color fill light, adjustable. Godox LED36 Video Light is excellent for macrophotography, product shooting, and video recording, etc. This lightweight and portable light provides high brightness and accurate color temperature. 1 Godox LED36 Video Light. YONGNUO YN360 Handheld LED Video Light 3200k 5500k RGB. 1 x Yongnuo YN360 (not including the batteries). Colorful 39.5CM ICE Stick Professional Photo LED Stick. Brightness Angle: 55° and 110°. Use NP-F batteries and Specified AC Adapter. 【Adjustable Light Stand】 The adjustable range of the light stand is 33"-78" /0.8m-2m. It is made of aluminum alloy, with excellent strength, and it can be rotated 360 degrees. The best angle of ring head’ inclination is less than 15°. The ZM128 adopts the ring appearance design, which is more gentle and even for the positive fill light, and can achieve the perfect shooting of the capture lamp. The lighting effect of ZM128 LED light source is gentle and smooth, and its TLCI and CRI 90. Spigot: 1/4 or 3/8. Powerful LED lamp with high power, low heating value and long service life. Turn the knob counterclockwise to decrease the color temperature. Supporting battery adapter to keep the long lasting. This LED Ring Light Kit is widely applied to YouTube videos, makeup, studio shooting, selfie, video blogging, portrait photography, live streaming, etc. Two knobs adjust color temperature (3200-5500K) and brightness (0% to 100%) separately. No extra color filters needed, it is easy and convenient to use. Power: 58W. Dimmable: Yes. 1 Tripod Head. Light Source: LED SMD. FILTER KITS. LED Bulbs: 448 pcs. Color Temperature: 2700-5500 Kelvin. Large campatiable letting you have more choice in using the Led Ring Light, Choose one best suitable for you. Craphy PT-176S Ultra-Compact LED Video Light Dimmable Panelwith two color filters On-. construction, you can carry this light around with you wherever you go. a. 176 led light beads, Small and Slim. Battery & AC Adapter. 1 x Dimmable LED Video Light. 1 x Power Adapter. 1 x Power Cable. 1 x White Diffuser. Dimmable LED SMD Ring Light with a wide dimming range from 1%-100%. Dimmable: YES. Special LED SMD design, lightweight and portable. Constant current drive, low power loss. Light Source: LED SMD. 1x LED SMD Ring Fill Light. Neewer Dimmable Bi-color LED with U Bracket and Barndoor Pro Video Light. 1 x Dimmable LED Video Light. White filter can make soften the light source and enhance skin tone in portraits photography. Adjustable U mount bracket makes the light toward different angle for the best shooting. Dimmable 13" LED SMD Ring Light with a wide dimming range from 1%-100%. Special LED SMD design, lightweight and portable. Constant current drive, low power loss. NO ultraviolet and infrared light radiation, low heat output, safety and environmental protection. Long service life of more than 50000hrs. With reinforced flexible arm which will move freely and never droop. Extra Long Cord and Heavy Duty Thumb Screws. 【Ring Light Dimmable 】- Dimmable 14"/35cm Outer 41W 5500K 168 Pieces LED bulbs with a wide dimming range from 1%-100%. Special LED SMD design, lightweight and portable. Dimmable LED Ring Light This light ring has 168 Pieces SMD LED bulbs with a wide dimming range from 1%-100%. USA LOCAL STOCK! Original Brand!! FAST SHIP! 3-5 Days! LED is ideal lightweight continuous lighting source. It is excellent for macrophotography, product shooting, and video recording, etc. This portable light provides high brightness and accurate color temperature. 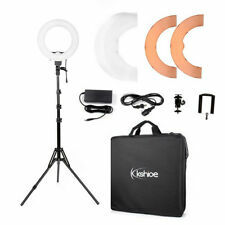 LED Ring Light 5500K Dimmable & Light Stand Dimmable Lighting Kit Youtube Live. 💡【Dimmable ring light】- Brightness (dimmable from 1% to 100%) and color temperature with a range from 3200k to 5500k can be adjusted directly by turning the dial. Design: Special 18" 5500K LED SMD Ring Light design. 448 pcs LED Bulbs, natural light, not dazzling. Dimmable: Stepless adjustable brightness ring light. | Dimming range: 50%-100%. Color Temperature: 5500K. 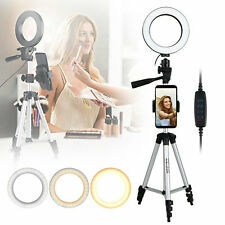 This LED Ring Light Kit is widely applied to YouTube videos, makeup, studio shooting, selfie, video blogging, portrait photography, live streaming, etc. Adjustable color temperature ranging from 3200K to 5500K provides bright and soft light and wide dimming ranges from 0% to 100%. No extra color filters needed, it is easy and convenient to use. ADJUSTABLE TRIPOD: A light tripod stand attached to allow you to adjust the height from 35cm/13.8” to 100cm/39.4”. MULTIPLE-PURPOSE: Equippeod with adjustable tripod heights and light brightness it can be used as desktop lamp or floor lamp as you like. Super-Slim LED Video Light 1 x LED Video Light. LED Bulbs: 144 pieces. Equipped with clear LCD display screen, it can show the information of product brightness, color temperature and the battery when in use. High-quality built-in 576 right light panel, With 288 White and 288Yellow LED long lasting bulbs, ultra 42W high power LED ring light panel, adjustable color temperature from 3000K to 6000K, and adjust brightness 0%-100%. Ultra Thin LED Video Light Panel Lamp Dimmable For DSLR Camera Camcorder Video Package Including： 1 x LED light 1 xSwivel and tilt adjustable ball head Note: Please kindly note that the Camera & Battery shown in picture are for demonstration only, NOT included. W/ CAMCORDER W/ DSLR W/ POINT-AND-SHOOT. Requires 2 AA batteries (not included). Array of 35 LEDs provide bright, even lighting up to 25 feet. Digital SLR. Point & Shoot. Key Features Color temperature balanced at 5500K for optimal image clarity. Adopts concentration LED lights, irradiation distance can reach more than 5m, suitable for long distance shooting. Features 160-LED lights for optimum illumination and diffuser. Includes two diffusers to help soften the light and reduce the color temperature to 3200K. Dimmable Range: 10 percent-100 percent. A twist of the dial is used to turn the light on/off and adjust the brightness; Adjustable brightness from 10 percent to 100 percent. LED Bulb Quantity: 176 Pieces.